Having slept in the day before: we were determined to see sun rise today which was at around 7.40am. The most famous sunrise site ‘Tongariki’, was on the other side of the island, a 40 minute drive away by car. On our quadbike however it was more like an hour so we set off at 6am in the pitch black and freezing cold from the wind chill. It turned out to be a lot further than we anticipated and eventually we arrived just before the sun rose at a late 8am. 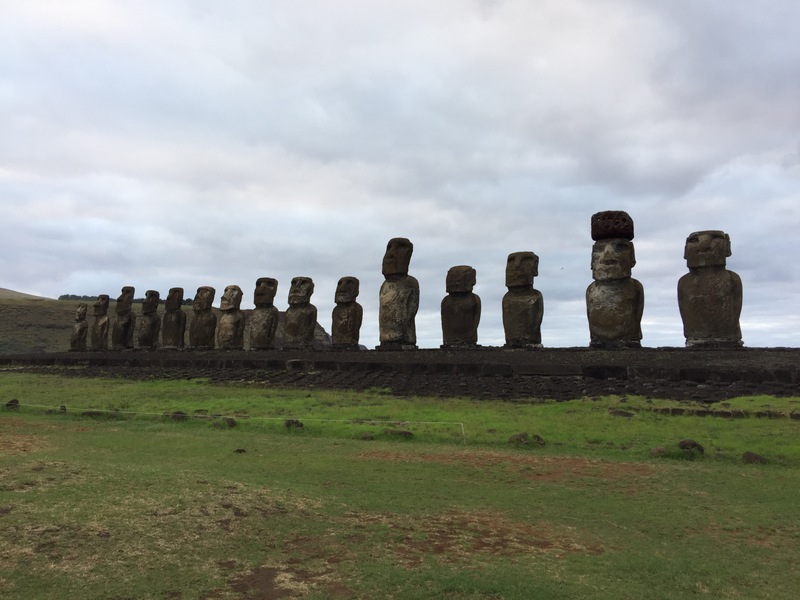 At the entrance to the site one Moai stood guard, looking down on the others and providing our first up close encounter. Below the main Moai were huge compared to what we had seen so far, and there were 15 all lined up on the platform. They ranged in sizes and states of erosion but were very impressive. What was also impressive was how everyone else had beaten us there, yet only one car passed us on the road! We did the usual walk around, selfies, photos etc and waited for the sun. However the sun was hidden behind cloud so didn’t make for dramatic photos but it had been worth the early start nonetheless. Sunrise done, we headed off on the quadbike back a few miles where we had come from to ‘Rano Raraku’, another extinct volcano whose green slopes were littered with Moai. In fact this is where they were carved out of the mountain before being transported across and around the island. After yet another ticket check and warning not to touch, we walked around the slopes. Moai were everywhere, half buried and poking out at different angles. Some lay broken on the ground others buried up to their noses. Here was arguably the shots we had been waiting for. We took so many from every angle I dread having to edit them! 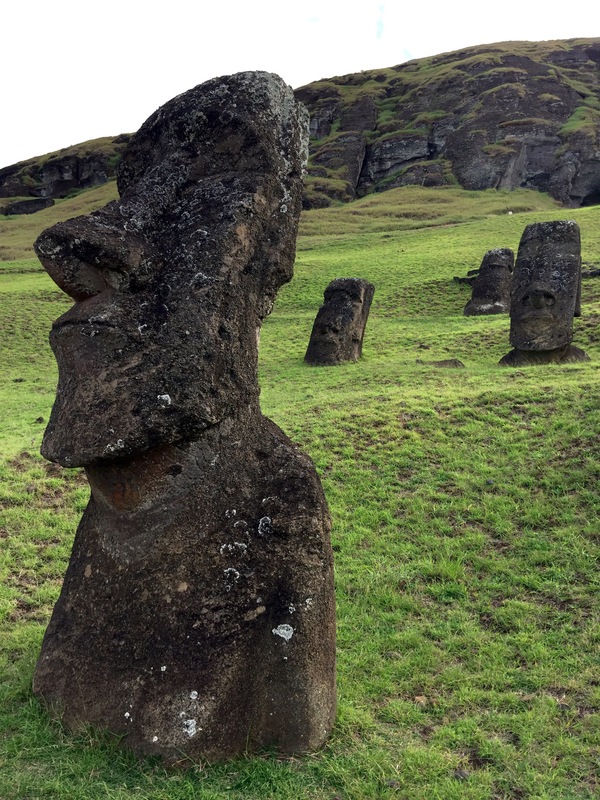 You could also see at two points Moai that were half sculpted but still encased in the mountain. It was like someone had just upped and left their job half way through. We headed back down off the hill and out of the site and found a spot to fly the drone over both sets of Mosi from the morning. Despite frightening a herd of wild horses (which are everywhere over the island as well as cows) we got some nice shots. After some quick breakfast Mike drove us around the top of the island for 50 minutes to the other side. Mountains gave way to coast as we headed towards ‘Anakena’ beach. We stopped on the way at ‘Ovahe’ cove: a pretty, secluded beach for photos. 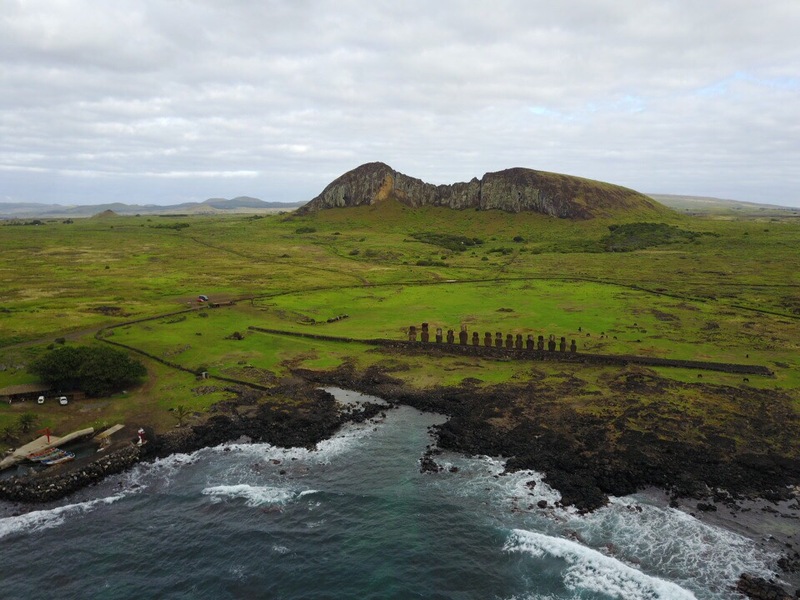 Anakena was another big sight on the island, famed for palm trees, a sandy cove and Moai overlooking the whole beach scene. These were quite different to the other Moai. 4 were complete, with red stone top knots; one without; one without a head; and a stump. They also had a different look about them being surrounded by white sand and palm trees. 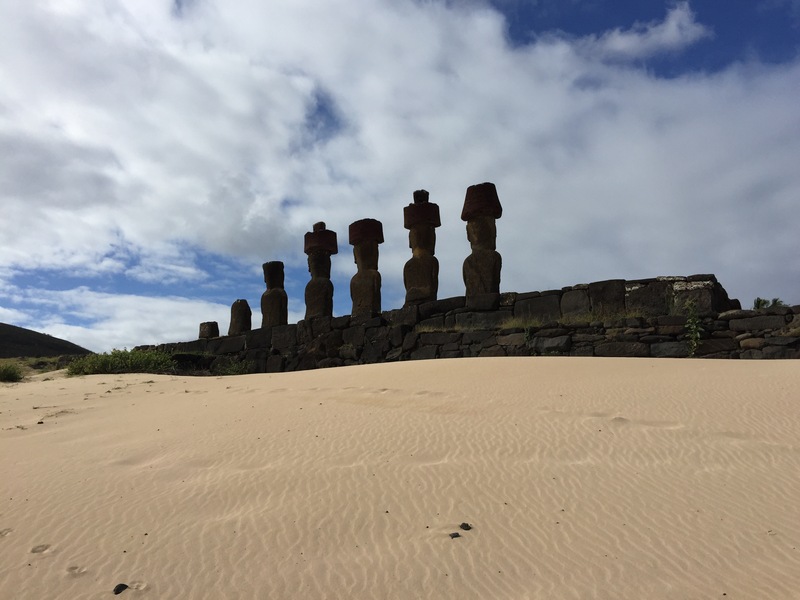 We walked around the dunes and discovered another Moai on his own just above the beach. After taking his picture we realised he was almost as fat as he was tall, making the picture look like it had been stretched badly. We walked along the sandy beach, practically the only ones there. The weather was rather grey and overcast so we gave lounging around on the beach a miss and headed back across the island, after our busy morning. The drive back was long, and we appreciated in the light just how long it was this morning. After 45 minutes we arrived back in town and to our hotel. In the evening, we headed out for dinner and sunset and made plans for our final morning on the island. We were in no rush the following morning having seen everything we wanted to, so we decided to go up the southern crater again so we could get a shot Mike had missed the day before. On our way we went a different route past the port, where we discovered another Moai not on the map. We’d come back and see him after the crater. 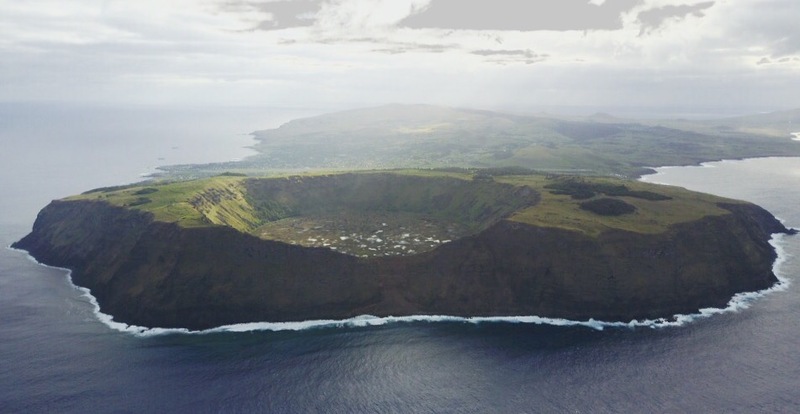 The weather wasn’t as good when we were previously up there, but Mike managed to send the drone out of the crater and over the sea to get the shot he wanted. On our return we visited the Moai by the port and got hassled by a pack of dogs (most dogs just running loose on the island in packs). They were rather large, and although mostly friendly; they wanted feeding. The occasional growl and scrap between them made us get back on the quadbike. We headed into town and handed back the quadbike to the rentals. It was now time to depart on the next leg of our trip after an amazing few days quadbiking around this small Pacific island – one of the most isolated inhabited places on earth. Next stop was Santiago for a quick sight see for 2 nights and then on to Brazil! I’ve been here before. It’s very interesting. I love your drone shots!